Premium 2" Basswood Blinds by Blinds Chalet are made of 100% premium, specially dried basswood for a quality look and durable finish. Each one of our 2 inch wooden blinds are custom made in the U.S.A. Available in beautiful paints and luxurious stains to match any decor. Unlike many other companies Blinds Chalet does not charge extra for stains. Whether its city light or country roads you can see out of your windows, our Premium 2" basswood blinds are the perfect fit! All of our Premium 2" Wood blinds conform to all child safety guidelines. Order these quality wooden blinds online today! W: 7" 8" 9" 10" 11" 12" 13" 14" 15" 16" 17" 18" 19" 20" 21" 22" 23" 24" 25" 26" 27" 28" 29" 30" 31" 32" 33" 34" 35" 36" 37" 38" 39" 40" 41" 42" 43" 44" 45" 46" 47" 48" 49" 50" 51" 52" 53" 54" 55" 56" 57" 58" 59" 60" 61" 62" 63" 64" 65" 66" 67" 68" 69" 70" 71" 72" 73" 74" 75" 76" 77" 78" 79" 80" 81" 82" 83" 84" 85" 86" 87" 88" 89" 90" 91" 92" 93" 94" 95" 96" 0/0"1/8"1/4"3/8"1/2"5/8"3/4"7/8" H: 12" 13" 14" 15" 16" 17" 18" 19" 20" 21" 22" 23" 24" 25" 26" 27" 28" 29" 30" 31" 32" 33" 34" 35" 36" 37" 38" 39" 40" 41" 42" 43" 44" 45" 46" 47" 48" 49" 50" 51" 52" 53" 54" 55" 56" 57" 58" 59" 60" 61" 62" 63" 64" 65" 66" 67" 68" 69" 70" 71" 72" 73" 74" 75" 76" 77" 78" 79" 80" 81" 82" 83" 84" 85" 86" 87" 88" 89" 90" 91" 92" 93" 94" 95" 96" 97" 98" 99" 100" 101" 102" 103" 104" 105" 106" 107" 108" 109" 110" 111" 112" 113" 114" 115" 116" 117" 118" 119" 120" 121" 122" 123" 124" 125" 126" 0/0"1/8"1/4"3/8"1/2"5/8"3/4"7/8"
Do these blinds fit inside the window casement/opening. Or do they overlap the window casement? Minimum Flush Mounting Depth:	3"
You can also choose outside mount to mount on the wall above the window. Very nice blinds. Great quality and fast shipping. I could not be more satisfied. Thanks again. Product arrived as advertised...excellent condition. Product arrived as advertised...excellent condition. Installation was very easy. Would definitely order again in the future. I first ordered 14 blinds for my house and when they arrived they all fit perfect and were easy to install. 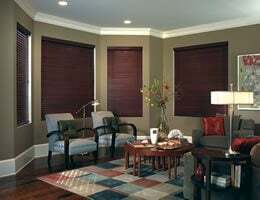 I first ordered 14 blinds for my house and when they arrived they all fit perfect and were easy to install. Recently ordered 3 more and very satisfied with the quality and fit. I can tell you that the blinds were very easy to install; looked well fitted to the window when installed. We are VERY pleased with the blinds. the "hold-down" brackets that were requested when ordering.